Autumn is a natural time for transitions as the weather begins to cool, and leaves change color and fall away. As we move into the season of fall, what are you able and willing to change or do differently? This workshop will carve out space for a mini-retreat which will include meditation, reflection, watercolor painting and intention setting at Bluebird Sky Yoga. Led by Erin Brindle, Art Therapist and Yoga with Rabbi Sarah Tasman. COST: $75. Email newcreations.dc@gmail.com to REGISTER. Do you feel like life is whizzing by? Take some time before the rush of the holiday season for a self-care retreat to give yourself some time to relax and rest. Join Erin Brindle, art therapist, and Sarah Tasman, community rabbi for this beautiful yoga and art workshop. 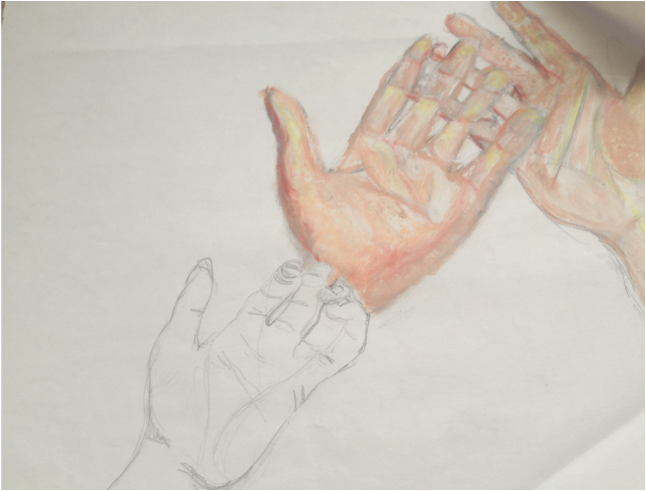 Hands of New Creations, Pencil and Oil Pastel on Paper, 2005.